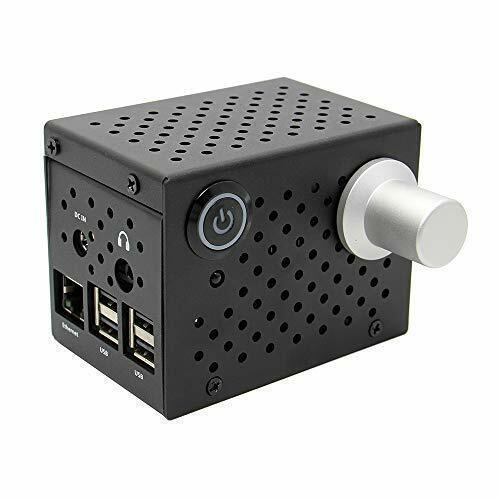 Geekwrom TB-100051 - All ports and slots of the case can match with Raspberry Pi and X400 perfectly, with 19mm metal latching power switch and high quality solid aluminum potentiometer Knob, protect your pi well. Note: the raspberry pi board and X400 board are both not included. For x400 V3. 0 expansion board, please refer to: X400 Expansion Board.
. Features - match with rpi and x400 - ultra-compact aluminum chassis - all ports and slots of the case can match with raspberry pi and x400 perfectly - exhaust holes surface can reach perfect heat dissipation - Equipped with 19mm metal latching power switch - Equipped with high quality solid aluminum potentiometer Knob - Raspberry Pi status LEDs still visible - Easy to change the Raspberry Pi OS SD card - No need to open the case - Reinforced aluminum material, lightweight and durable, long-lasting stainless - Weight: about 153g Match with x400 dac hifi expansion board and Raspberry Pi 3 Model B+ Plus/3B. Raspberry Pi X400 V3.0 DAC+AMP Expansion Board Matching Aluminum Metal Case/Enclosure+Power Switch Kit for Raspberry Pi 3 B+/3 B - Ultra-compact aluminum chassis, lightweight and durable, long-lasting stainless. All ports and slots of the case can match with raspberry Pi and X400 perfectly, Easy to change the Raspberry Pi OS SD card - No need to open the case. Exhaust holes surface can reach perfect heat dissipation. Equipped with 19mm metal latching power switch, aspberry Pi status LED, haluminum potentiometer Knob. Packing list 1 x X400 v3. 0 enclosure 1 x metal power switch 1 x Aluminum potentiometer Knob 4 x Screw M2. Element14 Raspberry Pi 3 Model B+ - Technical specifications: - broadcom bcm2837bo 64 bit ARMv8 QUAD Core A53 64bit Processor powered Single Board Computer run at 1. 4ghz- 1gb ram - bcm43143 wifi on board - bluetooth low energy ble on board - 40 pin extended gpio - 4 x usb2 ports - 4 pole stereo output and composite video port - Full size HDMI - CSI camera port for connecting the Raspberry Pi camera - DSI display port for connecting the Raspberry Pi touch screen display - MicroSD port for loading your operating system and storing data - Upgraded switched Micro USB power source now supports up to 2. 5 amps. Package contents : - 1x Raspberry Pi 3 Model B+ 1. 4ghz 64-bit quad-core armv8 CPU, 1 GB RAM. To take full advantage of the improved power management on the Raspberry Pi 3 and provide support for even more powerful devices on the USB ports, a 2. 5a adapter is required. New original raspberry Pi 3 Model B+ Built-in Broadcom 1. Element14 Raspberry Pi 3 B+ Motherboard - 4ghz quad-core 64 bit processor with low energy on-board wifi bluetooth and USB Port Built on the latest Broadcom 2837 ARMv8 64 bit processor, Raspberry Pi 3 Model B+ is faster and more powerful than its predecessors. It has improved power management to support more powerful external USB devices and now comes with built-in wireless and Bluetooth connectivity. Raspberry Pi 7TOUCH - 4 usb ports, full hdmi port, 40 gpio pins, Combined 3.5mm audio jack and composite video. Camera interface csi, display interface DSI, micro sd card slot now push-pull rather than push-push, VideoCore IV 3D graphics core. This 7" touchscreen display for the Raspberry Pi is perfect for creating portable and embedded projects where a keyboard and mouse would be in the way. The full color display outputs up to 800 x 480 and features a capacitive touch sensing capable of detecting 10 fingers. Only two connections from the pi to the display are necessary; power from GPIO or USB connection to the DSI port. Latest version of Raspbian OS required to operate correctly. Adapter board is used to power the display and convert the parallel signals from the display to the serial DSI port on the Raspberry Pi. Raspberry Pi 3.3190G 7" Touchscreen Display - Note: the display works with all existing Raspberry Pi models, however the mounting holes only line up with the newer board design of the A+, B+ and Pi 2. Screen dimensions: 194mm x 110mm x 20mm including standoffs viewable screen size: 155mm x 86mm Screen Resolution 800 x 480 pixels 10 finger capacitive touch Connects to the Raspberry Pi board using a ribbon cable connected to the DSI port. 1. 4ghz 64-bit quad-core armv8 CPU, 1 GB RAM. 802. 11n wireless lan, 10/100Mbps Lan Speed. Geekwrom TB-479042 - The adapter board handles power, signal conversion, and touch input conversion. Kit contents: 7" touchscreen display adapter Board DSI Ribbon Cable 4 x Stand-offs and Screws 4 x Jumper Wires. Compatible with 2018 latest raspberry pi 3 model a+ / raspberry pi 3 model B+ B plus; 2. Bluetooth 4. 2, bluetooth Low Energy. Popular size: as a reason of raspberry pi hat design: gpio pin connection expansion board is about 11 mm high and the screw hole diameter is 2. 75 mm, this spacer & screw & nuts pack is a perfect installation tool for Raspberry Pi 3 model B+ / 3B / 2B /B+. Packing list: 30 x m2. 5 x 5mm screws;30 x m2. 5 nuts; 15 x m2. Geekworm Raspberry Pi Installation Tool 124 Pcs/Lot M2.5 Series Hex Brass Spacer/Standoff + Nuts + Screws w/Storage Case Raspberry Pi 3 Model B+Plus / 3B / Zero W Accessories Kit - 5x5 +5mm spacers;15 x m2. 5x11mm spacers;15 x M2. 5x11+6mm spacers;15 x M2. 5x20+6mm Spacers. Add 4 x m2. 5x12+6mm spacer as user needs. Note: 1. 4 usb ports, 40 gpio pins, full hdmi port, Combined 3. Electronics-Salon RPi Power Relay Board Expansion Module, for Raspberry Pi A+ B+ 2B 3B. Alchemy Power Inc. Pi-EzConnect. Raspberry Pi 2 and Raspberry Pi 3 GPIO connector. A HAT to connect GPIOs and sensors to Raspberry a Pi-2 or Pi-3. RASPBERRY PI RASPBERRYPI3-MODB-1GB - Popular size: as a reason of raspberry pi hat design: gpio pin connection expansion board is about 11 mm high and the screw hole diameter is 2. 75 mm, this spacer & screw & nuts pack is a perfect installation tool for Raspberry Pi 3 model B+ / 3B / 2B /B+. Packing list: 30 x m2. 5 x 5mm screws;30 x m2. 5 nuts; 15 x m2. 5x5 +5mm spacers;15 x m2. 5x11mm spacers;15 x M2. 5x11+6mm spacers;15 x M2. 5x20+6mm Spacers. Add 4 x m2. 5x12+6mm spacer as user needs. Note: 1. The adapter board handles power, signal conversion, and touch input conversion. Kit contents: 7" touchscreen display adapter Board DSI Ribbon Cable 4 x Stand-offs and Screws 4 x Jumper Wires. Raspberry Pi 3 Model B Motherboard - Example: M2. 5 x 5mm Screws. 1. 2ghz 64-bit quad-core armv8 CPU, 1 GB RAM. It has improved power management to support more powerful external USB devices and now comes with built-in wireless and Bluetooth connectivity. 802. Eleduino bc1 - Packing list: 1, official 7" Touchscreen Bamboo Case*12, Rubber feet*1 1. 4ghz 64-bit quad-core armv8 CPU, 1 GB RAM. Popular size: as a reason of raspberry pi hat design: gpio pin connection expansion board is about 11 mm high and the screw hole diameter is 2. 75 mm, this spacer & screw & nuts pack is a perfect installation tool for Raspberry Pi 3 model B+ / 3B / 2B /B+. Packing list: 30 x m2. 5 x 5mm screws;30 x m2. 5 nuts; 15 x m2. 5x5 +5mm spacers;15 x m2. 5x11mm spacers;15 x M2. 5x11+6mm spacers;15 x M2. 5x20+6mm Spacers. Add 4 x m2. 5x12+6mm spacer as user needs. Note: 1. 4 usb ports, full hdmi port, 40 gpio pins, Combined 3.5mm audio jack and composite video. Camera interface csi, display interface dsI, Micro SD card slot now push-pull rather than push-push, VideoCore IV 3D graphics core. Eleduino Raspberry Pi Official 7" Touchscreen Display Bamboo Case - The case support raspberry pi offical touchscreen only，not contain the pi and touchscreen. Bluetooth 4. 1, bluetooth Low Energy.